By Scott Gilfoid: International Boxing Federation (IBF) mandatory challenger James DeGale (19-1, 13 KOs) thinks IBF/WBA super middleweight champion Carl Froch is flat out scared to fight him, which is why DeGale feels that Froch is dragging his feet at the idea of getting in the ring with him for a fight. DeGale thinks he’s worried about what could potentially happen with him losing the fight, and then wrecking his own legacy in the process. DeGale notes that Froch will get considerably less money to fight him than he did in his last fight against George Groves, and he thinks that’s one of the reasons why he’s not excited about the fight. Froch will get around $4-5 million pounds for a DeGale fight, says DeGale. 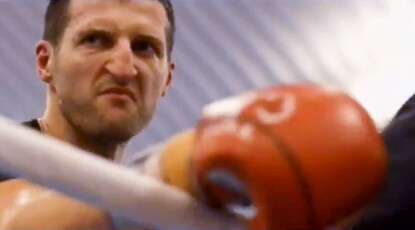 He thinks Froch won’t be interested in taking a huge pay cut to fight him. Froch has until December 31st to agree to fight DeGale otherwise he’s going to be stripped of his title by the IBF for failing to defend it. DeGale will be fighting next month against #11 WBC Marco Antonio Periban on the undercard of the Tony Bellew vs. Nathan Cleverly 2 fight card on November 22nd at the Echo Arena in Liverpool, UK. This is a safe tune-up fight for DeGale to get ready for whoever he faces next year for the IBF title shot. DeGale needs to look really good if he wants to increase his chances of getting a fight against Froch, because he’s not going to be able to get boxing fans excited about seeing him fight a guy who struggled against a limited fighter like Periban.